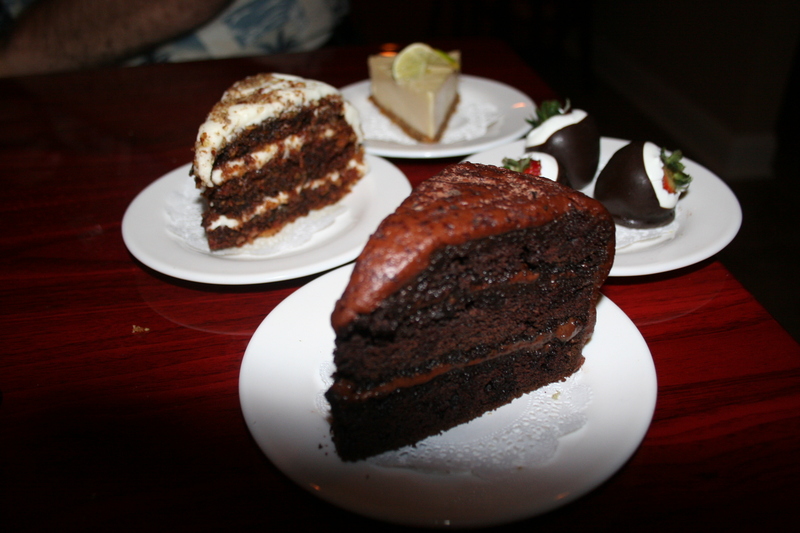 Open only three weeks, Christopher, on Kresson Rd (just off Brace) in Cherry Hill, had already drawn some nice reviews. Our little group of six hungry diners were anxious to see for ourselves what it was all about and that is what brought us there last evening. Nicely designed on the inside, Christopher features an alcove in the center that is unique and provides a more roomy feel to the room. 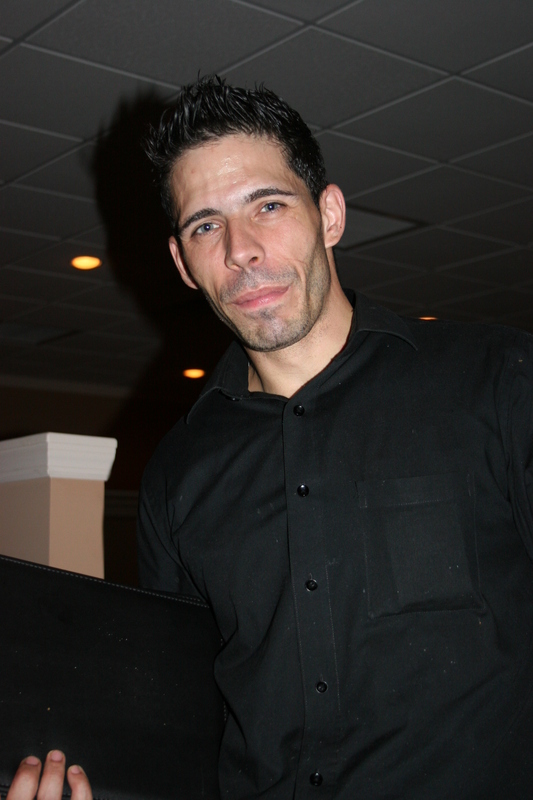 With Sinatra-type music playing softly in the background, our server, Michaelangelo, painted us a picture of the evening’s lone “special” (sorry, couldn’t resist). It was a stuffed flounder with a three cheese sauce. It sounded pretty good. 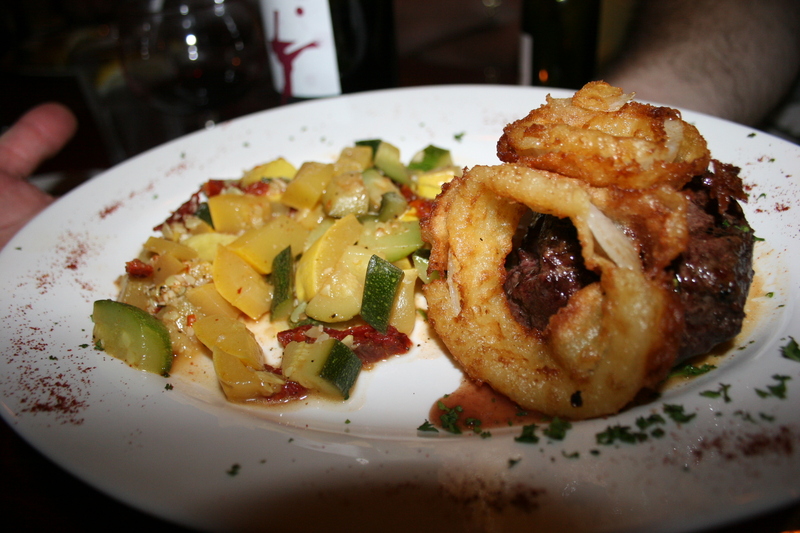 As our wines were opened, Michaelangelo suggested some appetizers and you could tell he took pride in being a part of this new culinary adventure. In fact, the entire staff seemed to work as a team in re-filling water glasses, removing dishes, stopping by to see if everything was OK.
As usual we had a few bottles of wine to go with our food. 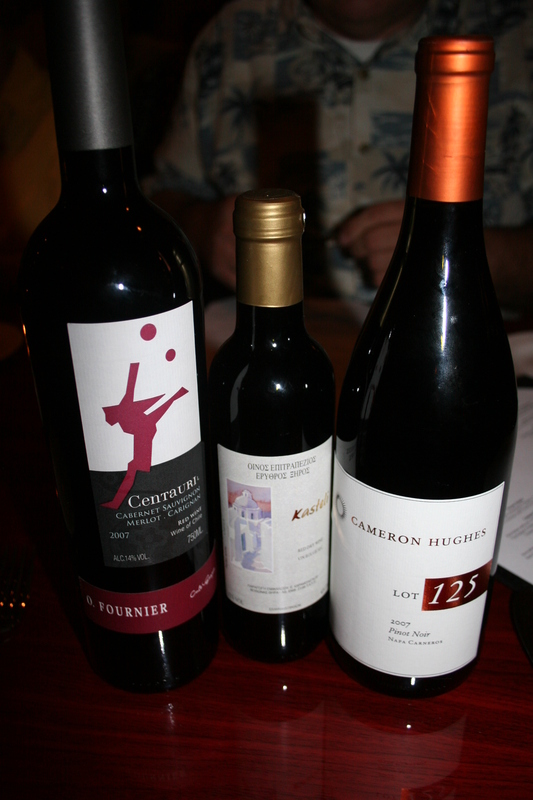 I had the 2007 Cameron Hughes, Lot 125, Pinot Noir, Carneros. I found this at Monster Beverage in Glassboro a few months back and I was pleasantly surprise how well this showed for a $20.00 Pinot Noir. Excellent notes of cherry and strawberries with a soft, smoky nuance. Joe B. has a very interesting wine, the 2007 O. Fournier, Centauri, Maule Valley, Chile. I have to confess, I have never been a big fan of Chilean wines but this one could convert me. It had loads of red and black berries with hints of tobacco and chocolate. It was exceptionally smooth and had a nice lingering finish. Jerry and Sue B.’s daughter, Katie, had just returned from a summer holiday in Greece and they had a .375 bottle she had brought home with her. The only word I could read on the label was Kastelli. The rest of the words were all Greek to me (I know…I know…I’ll stop). Anyway, it was from Santorini, on the island of Crete and it was light and, as stated on the label, dry and red. 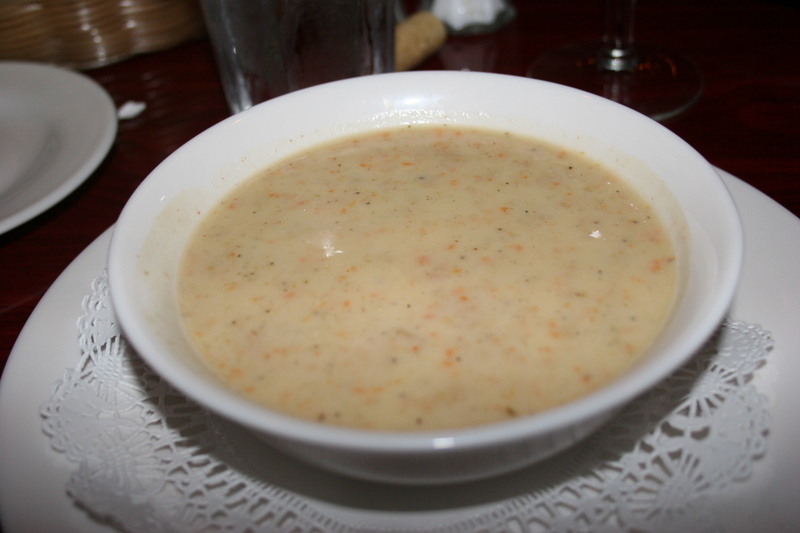 One of the signature dishes at Christopher is the appropriately named, Christopher’s Signature New England Clam Chowder (cup 4.95…bowl 5.95). Five of the six of us opted for this as our appetizer. I was glad to see Carol B. show some individuality and order what would have been my choice had I not felt like I had to choose the soup. Carol ordered the Pot Stickers. 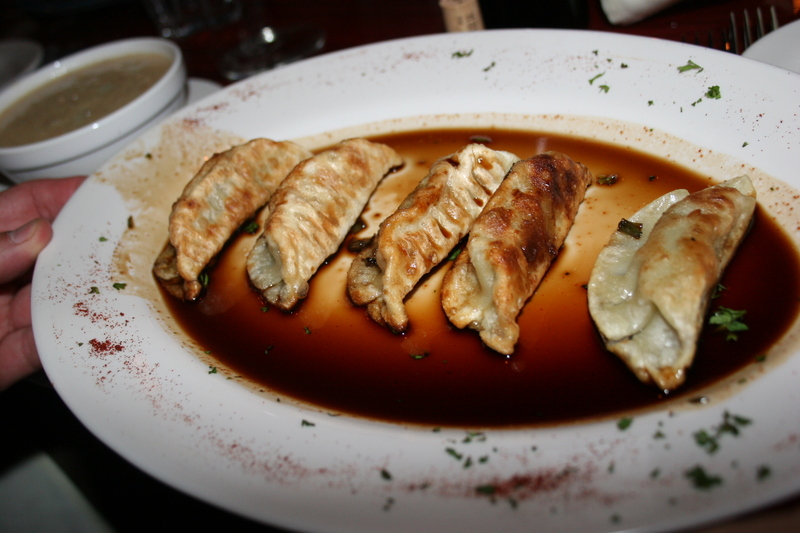 Wontons filled with pork, garlic and ginger, served with a honey-soy dipping sauce. She shared one with me and they were very tasty and a good value for $6.95. The soup was excellent. It was served at the perfect temperature and was chock full of nice pieces of clam, potato and veggies in a yummy broth with a couple of secret ingredients that Michaelangelo made me take a blood oath not to reveal, so I won’t. 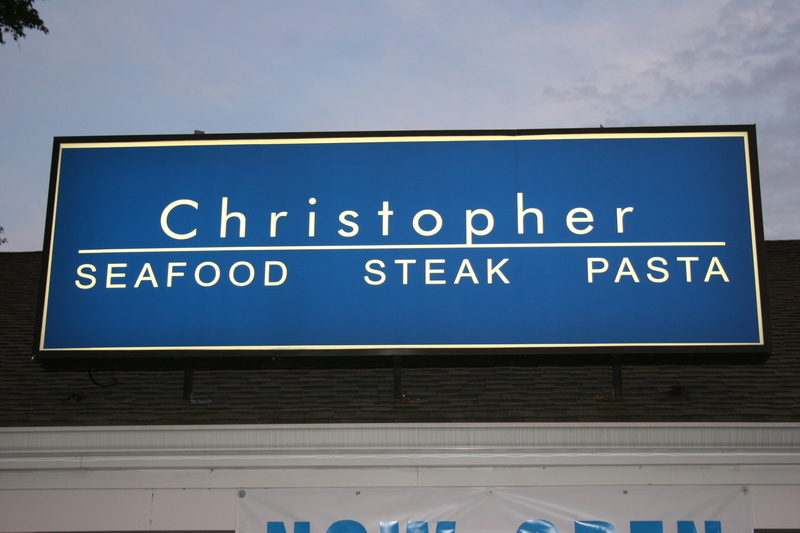 I have had some really good soups and chowders during the past year and although Christopher’s was not the absolute best it certainly does not have to make any apologies. 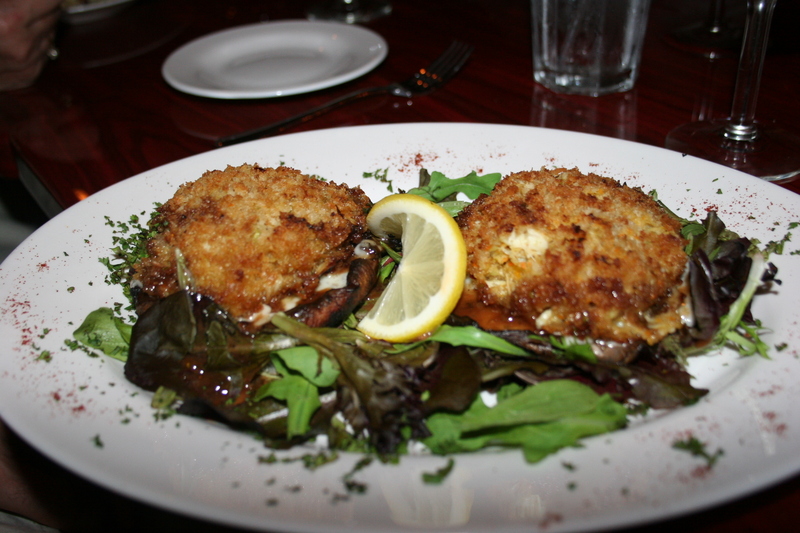 Joe B. and Jerry C. both ordered the Christopher Jumbo Lump Crab Cake with Portabello, a portabello musroom, basted and grilled then topped with a jumbo lump crab cake (actually TWO), melted provolone and served over spring mix and drizzled with a vinaigrette dressing. Carol had the Crab Cakes without the Portabello and it was like a Tale of Two Cities. Jerry and Joe enjoyed theirs very much. Carol found her crab cake to be mushy with a distinct absence of crab and a preponderance of filler. It could have been she just had a bad batch. I actually tasted both and the addition of the portabello definitely was an added plus for the dish (and this from an avowed mushroom hater). Bottom line recommendation, for three more bucks get the Portabello! I was totally pleased with my choice, the Spicy Crab. 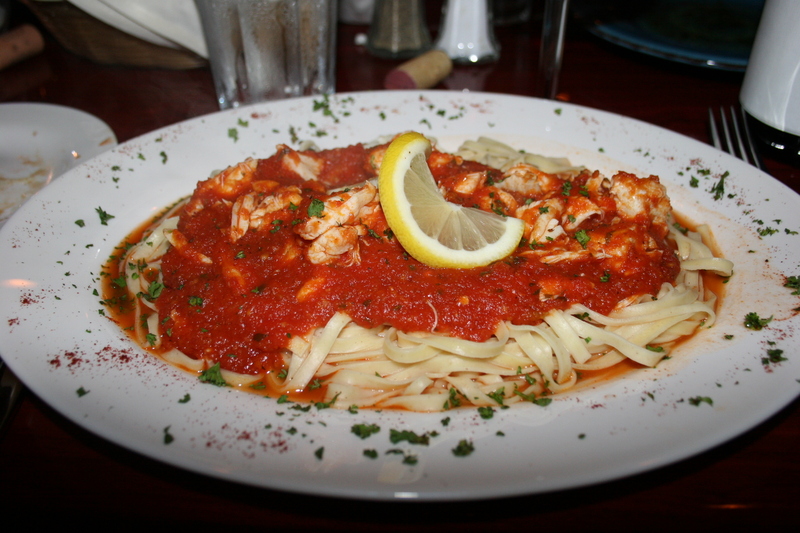 Linguine with jumbo lump crab meat in a homemade spicy marinara sauce. The sauce was good and the amount of crab meat was generous. I was able to take half home for another meal and I am looking forward to it. 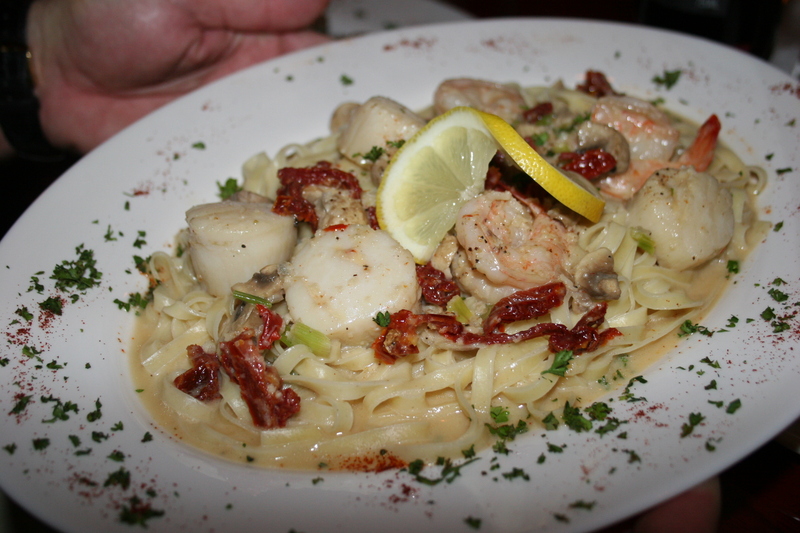 My wife, Kathy, chose the Scallops & Shrimp, served over a bed of linguine with mushrooms, scallions, garlic and sun-dried tomatoes. She enjoyed the shrimp and scallops but felt the linguine was over-cooked. I might add that most entrees are served with either a baked potato or a serving of summer veggies. They had run out of baked potatoes and so we settled for the vegetables. Sue C. can’t eat a lot of seafood so she searched the menu and found an 8 ounce Angus beef filet which is normally served with shrimp or crab meat (add $1.00). Sue passed on both of the seafood items and thought the steak was good. Michaelangelo came by to tempt us with his dessert tray and although we tried to be strong we were simply unable to utter the words “No Thanks” and consequently sampled the Chocolate Cake (light and luscious) the Carrott Cake (sweet and creamy goodness) and his personal favorite, the Key Lime Pie (excellent thanks to the addition of Meyer Lemon). We did pass on the Double Chocolate Strawberries so it’s not like we had NO willpower. Overall, I’d have to say that Christopher is off to a good start and that it shows lots of potential. Certainly, it merits another visit in the future.